Surface sclerites are generally poorly formed clubs. Colour: brown, cream, yellow or green. Members of this genus are widely distributed, and abundant in high light environments. Similar genus: Sarcophyton. 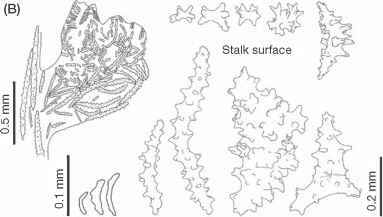 walls are generally thin, with few sclerites, permitting colonies to easily inflate with water, dramatically increasing their size ('hydroskeleton'). Although some genera are soft and floppy, others have a rough or distinctly prickly feel due to long, protective sclerites projecting beyond the polyp head. In the stem and branches, the sandpaper-like texture can be attributed to numerous, strongly sculptured, spiny sclerites in the surface layer. Sclerite forms include prickly needles, leafy clubs, irregular shaped spiky forms, and tubercu-late and thorny spindles, often extensively ornamented along one side. Members of this family are most often found in clear-water habitats. Nephthea (Fig. 21.11). Colonies are arborescent. Non-retractile polyps, supported by a bundle of scler-ites, are arranged in lobes. Sclerites are irregular, spindle or caterpillar-like. Colour: generally brown to green. Nephthea are found mostly in clear waters, often growing in clusters of several to many colonies. Similar genera: Stereonephthya, Chromonephthya, Lem-nalia and Paralemnalia. Dendronephthya (Fig. 21.12). Colonies are arborescent with the terminal twigs forming rounded, umbellate or tree-like groupings. Non-retractile polyps are arranged in small groups on the end of the twigs, protected by large supporting sclerites. Colonies are brightly coloured, azooxanthellate. The sclerites are similar to Nephthea. Dendronephthya are found in high currents, generally growing as individual colonies. Similar genera: Scle-ronephthya, Chromonephthya, Nephthea and Stereonephthya. Lemnalia (Fig. 21.13). Colonies are arborescent, formed from bare stalks and branches and generally thin twigs. 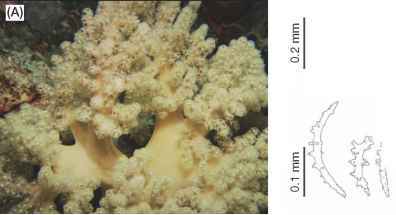 Nonretractile polyps are isolated on the twigs. Colour: cream to brownish. Interior sclerites are long, thin needles. Surface forms include capstans, crescents and brackets. Lemnalia are found in clear waters, growing as individual colonies, small clusters or large assemblages. Similar genera: Nephthea and Paralemnalia. Capnella (Fig. 21.14). Colonies are small, arborescent to lobed. The lobes are crowded with incurved polyps that are covered in club-like sclerites. Interior sclerites are often globular, with the surface ones leafy to spiky capstans. Colour: grey or beige. Capnella are found in a wide range of habitats, as individual colonies or in small groups of colonies. Family Xeniidae. 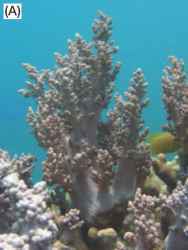 Members of this family often dominate offshore octocoral communities. Xeniid genera are mostly small and soft, and often quite slippery to touch. Colony growth forms are lobate, or thin and membranous with small retractile or tall polyps, or short, cylindrical stalks terminating with a domed polyp-bearing region. All species are zooxanthellate, often with opalescent pastel colours (white, pink, light iridescent blues and greens); some inshore species are dark brown. Some species have pulsating polyps, where the autozooids continually open and close the tentacle basket. Members of one genus have siphonozooids at least during some periods of their lives. Not all of the species in this family have sclerites. 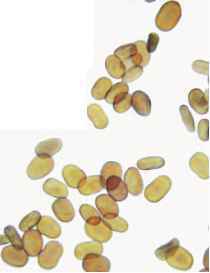 Where sclerites are present, they are nearly always minute platelets or corpuscle-like forms, with almost smooth surfaces, often appearing opalescent. 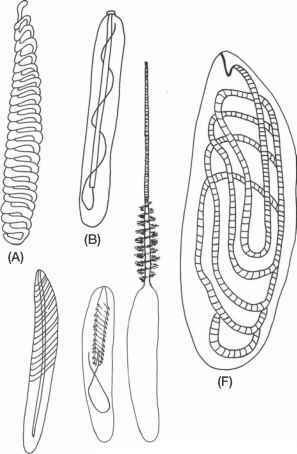 Only one genus has sclerites in the form of minute rods with a coarse crystalline surface. A microscopic feature of the family, observed only in histological preparations, is that only the dorsal pair of mesenteries retain their filaments in the adult polyps; the filaments on the other six mesenteries are absent or rudimentary. Xenia (Fig. 21.15). Members of the genus Xenia have sparsely branched colonies with the nonretractile polyps confined to the domed branch ends. Individual colonies tend to be small (often <5 cm in diameter), but often larger super-colonies (colony clusters) are formed. Scler-ites are minute platelets. Colour: white, grey to blue, yellow to brown. Xenia are abundant in clear waters; rarely found in inshore waters where they are dark brown. Similar genera: Heteroxenia and Asterospicularia. Efflatounaria (Fig. 21.16). 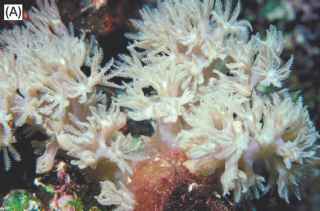 Species in this genus have highly contractile polyps that can appear to have retracted. 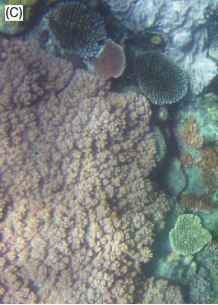 Daughter colonies are produced from 'runners' (stolonic outgrowths of terminal polyps). Sclerites are minute platelets or irregularly sub-spherical bodies. Colour: white, pink, yellow or blue. They are abundant in clear waters. Similar genus: Cespitularia. Family Briareidae. Briareum is the only genus in the family. On the GBR, different species of Briareum grow as thin sheets encrusting rock, or dead or live substrate. 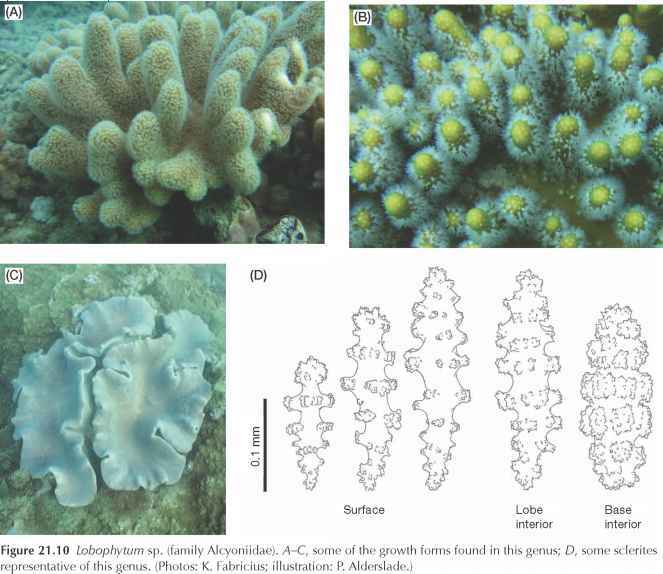 Most species resemble encrusting or lobular soft corals, but the division of the coenenchyme into a cortex and a medulla places them with other gorgoni-ans. 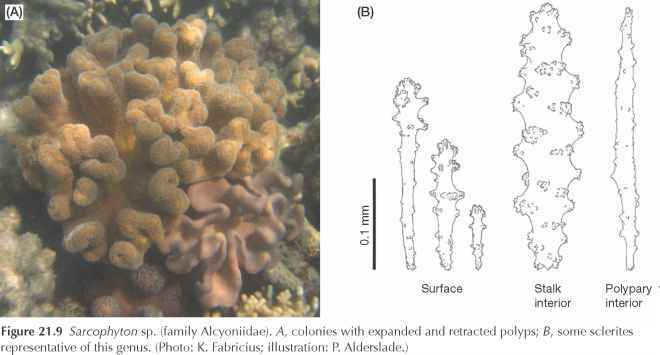 The polyp-bearing surface of the colony may be virtually smooth, or it may have calyces that can be up to 10 mm tall. The basal layer, or medulla, which is attached to the substratum is deep magenta due to the colour of the sclerites. The upper layer, or cortex, may be magenta or almost white depending upon the amount of coloured sclerites it contains. 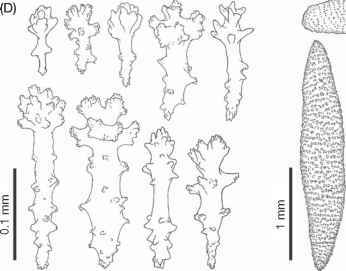 Except for the most basal layer of the medulla, the sclerites are all spindles, sometimes branched, with low or tall, spiny tubercles arranged in relatively distinct girdles. The most basal layer generally includes multiple branched, reticulate and fused forms with very tall, complex tubercles. Briareum (Fig. 21.17). 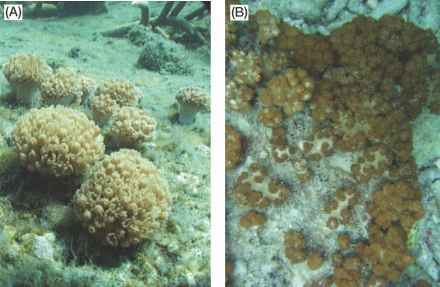 On the GBR colonies form encrusting sheets, which in some species may form filo-pastry style colonies through successive layering. The polyps are fully retractile. Calyces are tall to exceedingly small. The sclerites are spindle-shaped and multiradiate, sometimes fused in clumps. 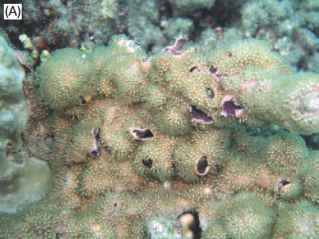 Commonly the surface layer is beige-brown and the basal layer magenta, but in some species the surface is also magenta, while polyps may be iridescent green or yellow. Members of Briareum can be abundant on inshore reefs where they can grow to sheets >1 m in diameter. Similar genus: Rhytisma. Family Subergorgiidae. 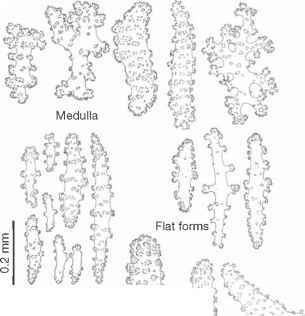 In this family the medulla is relatively consolidated: sclerites are branched, interlocked, partially fused, and also embedded in a tough matrix of gorgonin. There is a ring of boundary canals directly outside the medulla below the cortex, but there are virtually no canals running through the medulla. Colonies are either arborescent with free branches, or as net-like fans. Axial sclerites are usually smooth and sinuous, relatively long, and form a network. Sclerites of the cortex are predominantly tuberculate spindles and ovals, and small, irregularly shaped dumb-bell-like sclerites often referred to as double-heads or double-wheels. Using just external features, species in this family are easily confused with those in families with no sclerites in the axis.